Amigo Mexican Restaurant was voted this year's Chattanooga Times Free Press Best of the Best People's Choice Award winner in two categories - Best Mexican Restaurant and Best Meal for the Money. "At all our locations we serve authentic Mexican recipes," says Christian Kozak, general manager of the Brainerd location that opened in 2001. "We believe if you have great food and service with a clean place it is the perfect equation for a successful business." 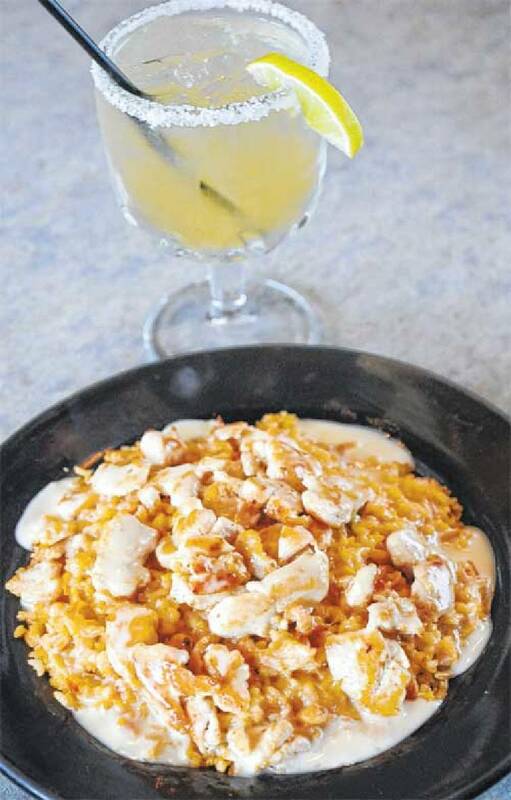 Amigo Mexican Restaurant has locations in East Ridge, Brainerd, Red Bank and Hixson. With Christmas around the corner, Kozak says the restaurant sees larger groups of families and friends coming in to dine together. The menu offers a little bit of everything with entrées for everyone to share such as the Amigo nachos with flour tortilla chips covered with melted cheese, grilled chicken and steak, sautéed bell peppers, tomatoes and onions. Also popular for groups is the Amigo dip with fresh spinach, onions, tomatoes and cilantro sautéed to perfection and mixed with white cheese sauce and garnished with sour cream. Special Guadalajara with house margarita. "We are popular for our flavor," Kozak says. "That's what keeps people coming back. About 95 percent of our customers come in and have to get the cheese dip. It is delicious." Monday nights are taco nights and Kozak says they are popular group nights, when from 5 p.m. to close, Amigo features 75-cent beef hard-shell tacos. Happy hour is from 3-9 p.m. every day with $2.99 domestic drafts, $2.25 domestic bottles and two-for-one margaritas. 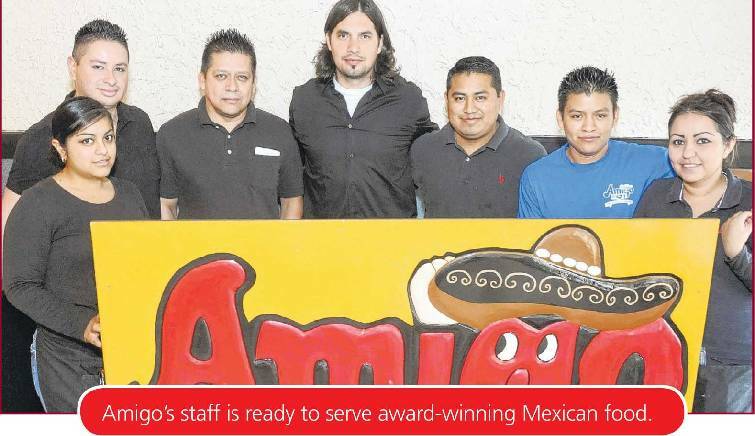 "At all the Amigos we emphasize great service," Kozak says. "Our dishes are all made from scratch daily." The restaurant's fresh tamales are cornmeal with pork filling topped by beef, cheese and red sauce. The restaurant features traditional Mexican-style tacos as well with corn tortillas and grilled steak topped with cilantro and onions. Amigo also offers value for guests with lunch specials starting at $5. The Speedy Gonzales features one taco, one enchilada and the guest's choice of rice or beans. The quesadilla deluxe is two layers of quesadilla filled with shredded chicken and gooey shredded cheese topped with fresh lettuce, sour cream and tomatoes. The menu is versatile, offering vegetarian and lowcarb entrées. The vegetable fajita is prepared with sautéed mushrooms, rice and beans. The vegetarian delight quesadilla is filled with beans, cheese, bell peppers, tomatoes, onions and mushrooms. A low-carb dish is the Jalisco quesadilla with cheese, fresh spinach, sautéed mushrooms and onions served in a low-carb tortilla. LOCATION: 3805 Ringgold Road, 5694 Brainerd Road, 1906 Dayton Blvd., and 5450 Highway 153. PHONE: East Ridge at 624- 4345, Brainerd at 499-5435, Red Bank at 870-9928 and Hixson at 875-8049.